EngagingPatients.org What We've Learned: Recognizing the Best in Patient and Family Engagement Programs - Welcome to EngagingPatients.org! EngagingPatients.org created the Sherman Award for Excellence in Patient Engagement in 2014 as part of our ongoing mission to share best practices in patient engagement. Very simply, we believe improving communication and boosting patient and family engagement will result in better care, advance patient safety and improve outcomes. What we didn’t know until we dove into this space is how patient and family engagement cuts across the entire spectrum of care. We continually are impressed by the vast array of programs in acute, ambulatory, pharmacy and long-term care that target patient engagement. Our goal with the Sherman Award is to highlight and honor that work. Reviewing nominations gives us an exceptional picture of work being done in the patient engagement space. We are now accepting nominations for the 2017 Sherman Award and expect to see a fantastic display of programs, as we have for the past several years. We hope you will take some time during the next few days to identify your best patient and family engagement work. We accept self-nominations, so why not take a few minutes to toot your own horn? We’d love to learn more about what you are doing. We’ve had unprecedented interest in the award—more than 120 forms have been downloaded. Now, we are asking you to take the plunge and submit a nomination. Nomination forms are due on Friday, March 3. We will send one person from the winning program (all expenses paid) to the National Patient Safety Foundation’s annual Congress in May. To help you think about your nomination, we’ve gathered a snapshot of What We’ve Learned from previous winners and finalists. For more details about these and other nominees, please visit the Patient Engagement in Action archive. Iora Health was recognized for a transformative approach to patient care that focused on building an engaging new model of high impact relationship-centered care with a specific patient population—Dartmouth College employees. The program restructured Iora’s financing model, assigned personal health coaches to each patient and transformed their business and staffing model to truly address patient needs and desires. As a result, the team: increased clinical quality; reduced use of expensive medical services (including hospitalizations and emergency department visits); and enhanced the quality of patients’ care. When CHOP needed a new center for pediatrics, it involved patients and families in every step of planning and execution. A significant portion of the population visiting the Buerger Center for Advanced Pediatric Care are diagnosed and treated for Autism Spectrum Disorder. To ensure the hospital was addressing the unique needs of these children, CHOP’s Patient and Family Experience Team and Outpatient Clinical Service Leadership actively involved patients and families from inception to completion in the design, planning, patient flow layout and construction of the Center. The North Shore LIJ Health System’s Patient Identification Team focused on a system-wide approach to standardizing patient identification. They involved patients and families in the process and created multiple tools including Eight Critical Elements for Patient Identification and Eight Patient Rights. Staff at Children’s Hospital of Philadelphia was frustrated by lagging survey data as the source of information about patient and family experience. The staff created Real-Time Patient and Family Check-ins. Nursing and family leaders worked together to determine the best way to connect with families at the point of care while they were at the hospital. The check-ins gave the staff ways to identify best practices and service recovery opportunities and gave them real-time metrics. Hospital readmissions for COPD are often the result of inadequate out-of-hospital care, a suboptimal understanding of the disease or medications and lack of knowledge of the steps for self-care. Signature Healthcare Brockton Hospital created a COPD program that empowered patients to participate in self-directed care, improve pulmonary health and reduce preventable readmissions. CHOA’s Asthma Center of Excellence is 97 percent Medicaid and primarily urban, which puts their population at even greater risk for poor outcomes from persistent trigger exposure, substandard housing and social issues. Staff at the Asthma Center of Excellence focused on building relationships with families, addressing barriers, creating regular community outreach and education. As part of its overall strategy to boost patient engagement, Children’s Healthcare of Atlanta created Family Advisory Councils (FAC), including seven diagnosis-specific programs and a system-wide FAC. Children’s also launched a Family Mentor Program that partners experienced parents with families of children newly diagnosed. These innovations have resulted in meaningful changes that improve the patient experience and better engage with the community. Cleveland Clinic’s Center of Excellence in Healthcare Communication’s effort leveraged relationship-centered care to engage patients more effectively with their providers. Building these relationships can be therapeutic for both, foster safety, build loyalty and grow trust if built with effective strategies. Cleveland Clinic transformed an amorphous topic–communication skills–applied a strategy to their entire organization, created a consistent model and gathered data to demonstrate results. Families are essential allies in healing and recovery. To help patients feel more comfortable, Contra Costa redefined family by letting the patient decide who they wanted to receive information about their care. They also expanded their policy to let those family members visit whenever it is convenient for them and the patient. Working to implement the policy has led to more collaborative projects with patients and family members by having them as active members on improvement teams as well as on executive teams. The Hospital and Healthsystem Association of Pennsylvania (HAP) developed a program that established the first state patient/family engagement advisory council; incorporated patient/family engagement in its hospital engagement network contract; developed an electronic tool for hospitals to assess their success; created a guidebook for members; added patient voices to the HAP Board of Directors; and incorporated patient voices in its website and strategic plan. 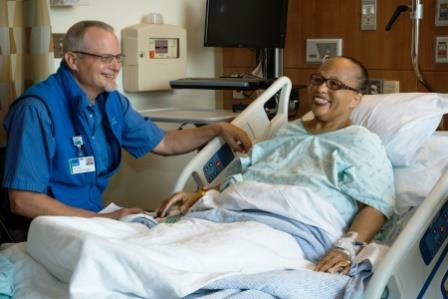 In an effort to reduce 30-day readmission rates for heart failure patients, Preston Memorial staff discovered that health literacy was an issue for their heart failure patients. Patients couldn’t tell for themselves when they were gaining significant amounts of fluid weight that would require treatment. Some patients couldn’t afford scales. Others didn’t have the ability to see or read the scales. And some weren’t able to track their weight. The Sunday Shoes Program was a simple way for patients to tell if they had gained weight–if their best shoes were tighter from one weighing to the next. Patient and family volunteers also can serve as peer partners to other Virginia Mason patients. Virginia Mason’s strategic plan puts the patient at the top and sets the direction of providing an extraordinary patient experience and systemizing breakthrough innovations by deliberately incorporating patient and family voices. The Virginia Mason approach uses experience-based design methods to understand emotional experiences and touch points of patients and families, embeds patient-family partners in improvement work and integrates their voices into an improvement methodology: the Virginia Mason Production System.